At 5AM I woke up to a quacky duck right next to my head. My feet were stiff from yesterday. It took a couple minutes to get them to work properly. I popped a couple of Aleve with breakfast. Evidently my campsite is a popular picnic stop for boaters. As I was packing up, a couple of early morning jet skiers zoomed up. A boatload of people followed and started setting up a canopy as I walked out. It must still be the weekend. The trail followed the contours of the lakeshore for another few miles. Then it started climbing the chaparral covered hillside. It was hot. Sometimes a wind blew through and brought the temperature down. 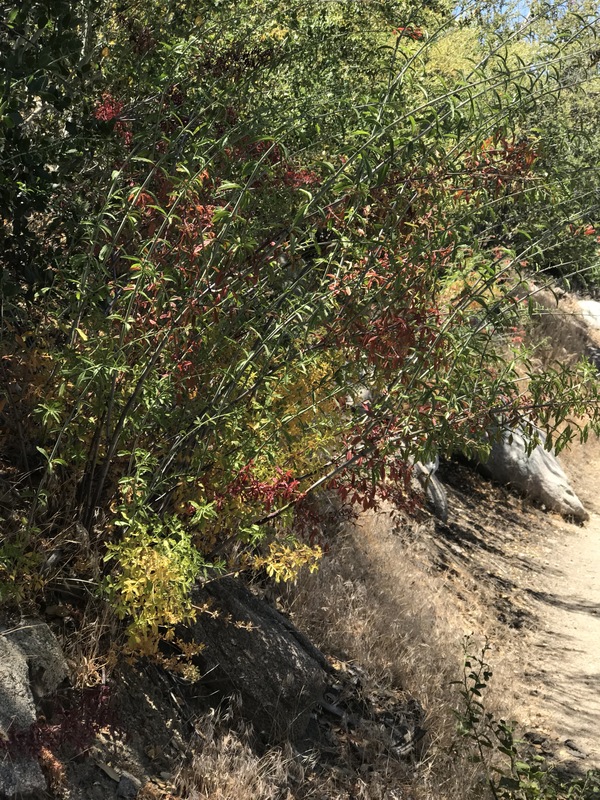 Occasionally I passed through the shade of a large bush of poison oak. Or something that looks like poison oak except with super mini leaves and huge berries. Probably it’s still poison oak. Anyway I’m not testing it. At least I know what that one looks like. I’m very worried about this poodle dog bush that apparently puts you in intensive care if you brush against it. I don’t really now what it looks like. I’ve heard from various sources that it has purple flowers and smells like marijuana. There are a few plants around that could fall in that category. The trail wound around some ridge tops and some spectacular views popped up. Mostly what I focused on was the mountain in front of me. I’d be climbing that soon. Sooner than I might feel ready. And somewhere, between me and that mountain, was a McDonald’s. The famous McDonald’s of Cajon Pass. Hikers tell tale of this particular restaurant. It must have been something to see in the height of the hiker bubble, all that hiker trash overflowing the booths. Normally I spend very little time thinking about fast food. Today it was all consuming. 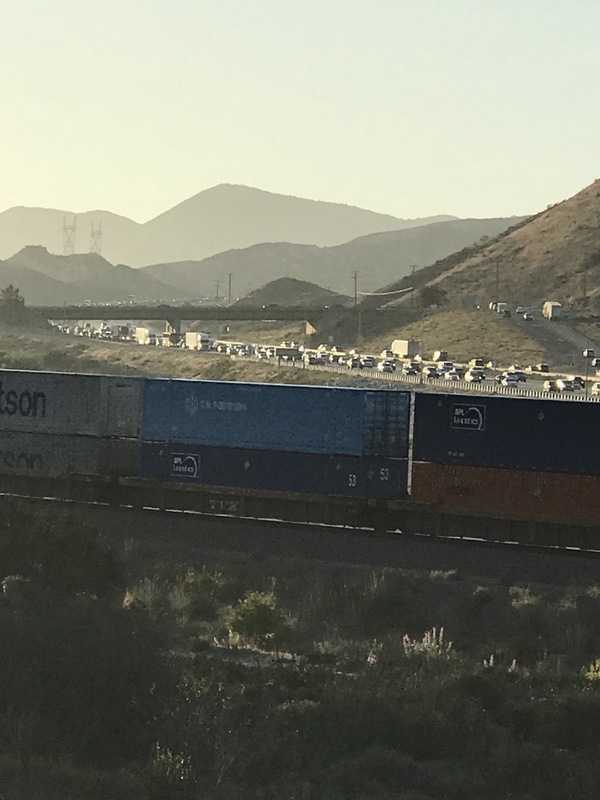 I could hear the freight trains going through Cajon. A few days ago, I was crossing under Interstate 10 and now I was approaching I-15. 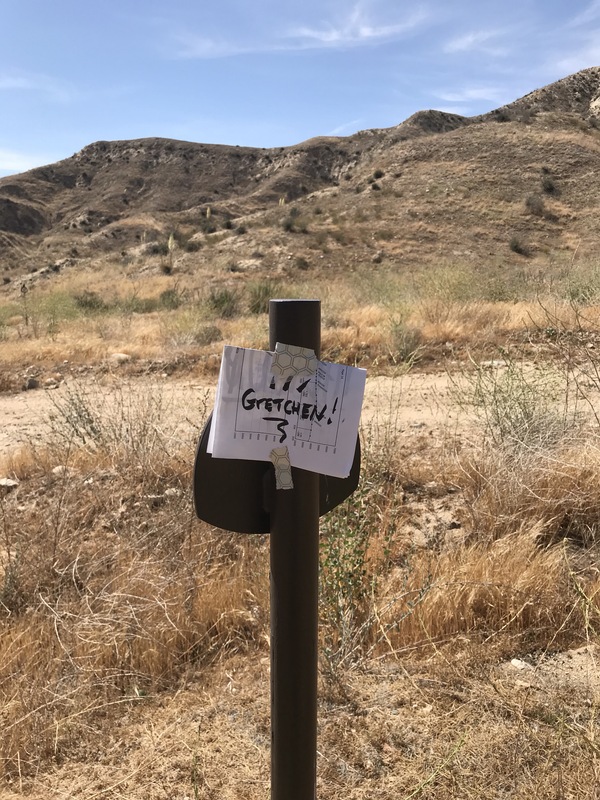 In the last couple miles, I came to a PCT sign that had a piece of paper taped to it. It said my name! Aww, Pumpkin! ﻿ I came around a few last hills and suddenly I was staring at huge freeways and freight trains and lots of noisy civilization. The dirt trail turned into pavement. I clumped up the hill to the Golden Arches. Pumpkin and Snacks were just leaving. They gave me the run down. I guess I sat inside McDonald’s for an hour or so. Mostly drinking beverages. I wasn’t very hungry, turns out, just thirsty for bubbley liquids. Next door at the convenience store I bought too much candy. In the parking lot, there was a dude under an umbrella selling cut fruit. 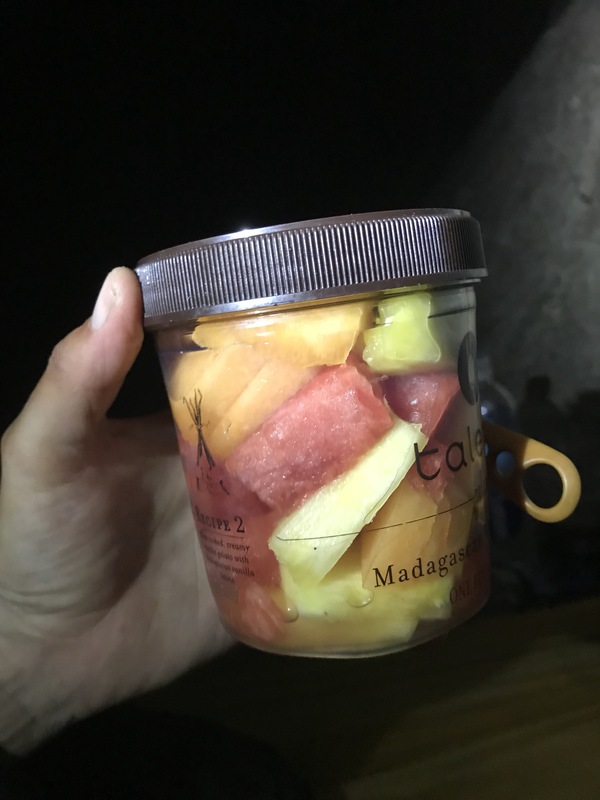 I asked him to fill my plastic jar with melon, pineapple, and watermelon. The hike through the pass was sort of fascinating. 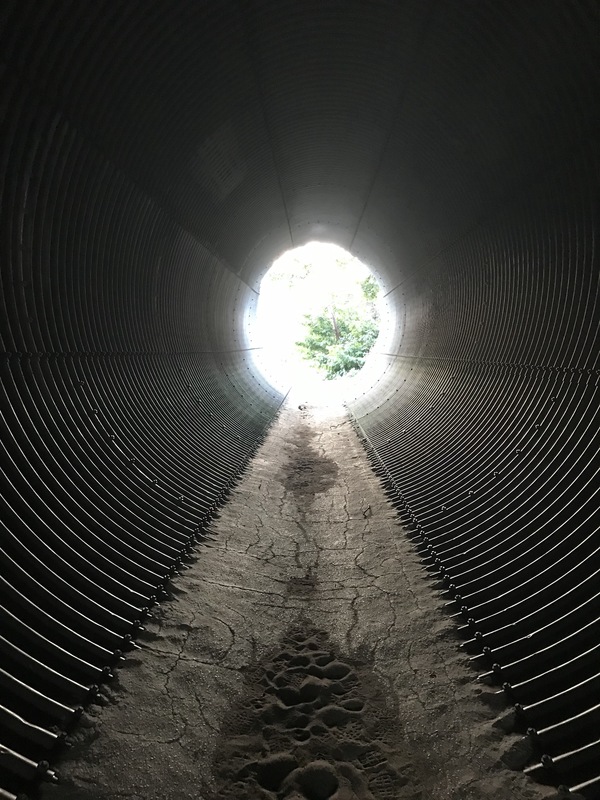 There were tunnels under the Interstate and the railroads. Double stacked freight trains rumbled by. As the sun set, I started the climb away from the pass. I was maxed out on water and it was heavy. The next water wasn’t till Guffy Campground, about 22 miles away. I climbed until it was dark, up to about 4000 feet. I saw a sandy spot just big enough for my tent and plunked myself down. I wish I had fresh fruit snacks every night.